Trailing by three in the fourth, Alex Phillips crushed a ball to deep left center field splitting the A’s outfielders. Phillips cruised into second standing up. With the first baseman in scoring position, Jordan Maxson slapped a ball into right field for an opposite field single. Phillips came around to score putting the Mustangs on the board. The Clarinda A’s scraped by the Mustangs 5-4 in the MINK league north division wild card game on Wednesday night. Continuing the fourth inning rally, Easton Fortuna smoked a ground ball that squirted under the glove of the A’s shortstop. Maxson advanced to second. Zach Purdue capitalized on the error. The second baseman found the grass in centerfield as Maxson raced around the bases to cut Clarinda’s lead to one. Mustangs starting pitcher Joseph Hietpas threw seven innings giving up eight hits and three earned runs. Trailing 5-2 in the eight, St. Joe got some help from their opponent. With runners on first and second a double steal was initiated. A’s catcher Zeth Malcom sailed a throw into centerfield allowing Alex Phillips to speed home. The Mustangs loaded the bases in the ninth but were unable to push the tying run across. Mason Janvrin went 2-4 with a walk. Jordan Maxson went 2-4 with two RBI and a run scored. Alex Phillips went 2-2 with two walks. The Mustangs have never missed the playoffs in their nine years in the MINK league. St. Joe finishes the season with a record of 24-24. The loss concludes the Mustangs 2018 season. The Mink league playoffs will continue with the divisional round matchups at 7 p.m. Thursday July 26. The championship series will begin July 27. Visit minkleaguebaseball.com for all playoff matchups and times. 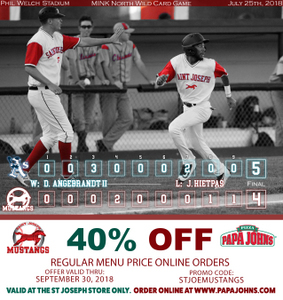 For all information on Mustang’s offseason visit stjoemustangs.com, follow the team on twitter (@StJoeMustangs), like the team on Facebook (St. Joseph Mustangs), and follow the team on Instagram (St. Joe Mustangs). For a glimpse at the game-day experience follow the Mustangs on Snapchat (stjoemustangs09).